We’ve spent some hours here before after shows, but this is the first time for us to play Solana Beach’s own Saddle Bar, and we’re stoked! 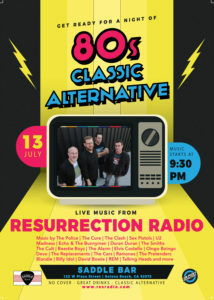 Get ready for a night of ’80s classic alternative music at Saddle Bar. We’ll be delivering songs by artists like The Clash, Duran Duran, Devo, Oingo Boingo, Blondie, U2, The Pixies and many more.